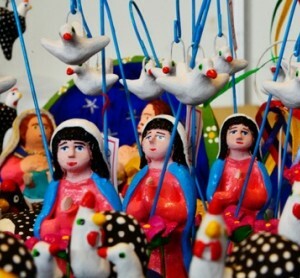 In a valley nestled in the mountains away from the megalopolis of São Paulo and Rio, a sculpture tradition is kept alive by makers for hundreds of years. The Figureiras de Taubaté are a group of sculptors from Taubaté, a city located about 123km from São Paulo towards Rio de Janeiro. You may ask, what is a “figureira”? Well, this is not even a word that can be found in the Portuguese dictionary, but if it could, it would literally translate to “shape maker” and refers to the feminine gender because of the predominance of women sculpturers – even though many men also make the items. The word actually comes from the tradition of sculpting animals, supposedly introduced back in the 17th century, when Franciscan friars brought sacred art from Italy for the Christmas decorations of their Convent – local animals were needed to complete the nativity, which were made by local artisans. Since then, clay modeling of religious themes, animals and other associated rural figures of the daily life in the countryside – particularly the many variations of the bright royal blue peacock, an iconic symbol of São Paulo craft – were passed down through generations and became the livelihood of many people, who initially made the items at home to sell them to buyers visiting the town. But it was not until the early 1990s that the work of the Figureiros started to gain real popularity, with public policy programs introduced to encourage their craft as a means of income generation and preservation of intangible heritage. Around the same time, the artisans got a home: the creation of the Casa dos Figureiros came out of the necessity to bring makers together by providing them with a workspace and a location to showcase and sell their items. Today, the Casa dos Figureiros is the studio, exhibition space and shop location for 35 artisans- and a must-visit for any tourist staying in Taubaté or passing by on their way to of from Rio de Janeiro or São Paulo. 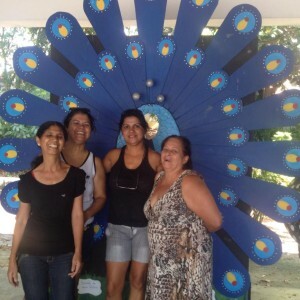 Click here to read more about the current day-to-day of the Figureiras from Taubaté.